What Makes ♥R RUIYA Car Navigation Screen Protector♥ Become Amazon's Best Slling? ✔ Perfect 0.26mm thickness. Maintain the mint condition of the navigation screen without sacrificing its touch capabilities while improving its smoothness and clarity. 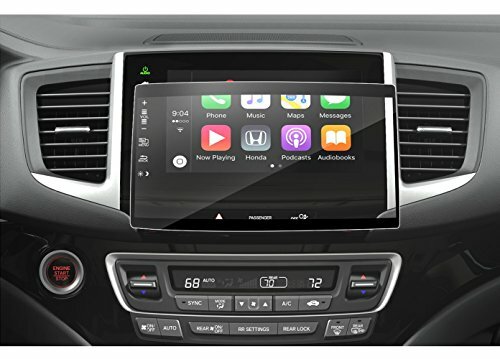 It is suitable for the Honda Pilot,measures 8-inch. If you meet any problem in installation,pls free to contact us,we will try our best to resolve it for you. IMPORTED GLASS MATERIAL with advanced nanotechnology,and laser cutting to fit the original device screen. 9H HARDNESS Anti-Scratch & Anti-explosion,Automatic Adsorption,can protect your beloved car's screen effectively. ULTRA-THIN THICKNESS Will not affect the sense of touch,can maximum restore the color. NANO-COATING Against the fingerprint,Oleophobic and Waterproof. GIFT PACKAGE INCLUDED:1 X Tempered Glass Screen Protector;1 X Toolkits.